As you know, I recently restarted building the Lion Knights’ castle after a summer hiatus. The incomplete set had gathered some dust during the break and my brick stash was dirty as ever, so some LEGO washing was unavoidable. Using a vacuum cleaner for the set crossed my mind, but the idea of LEGO being sucked into the machine didn’t really tempt me after the near-disaster involving minifigures and toilet plumbing. So, I came to try something else: an air duster. Turns out, perhaps not the best idea. 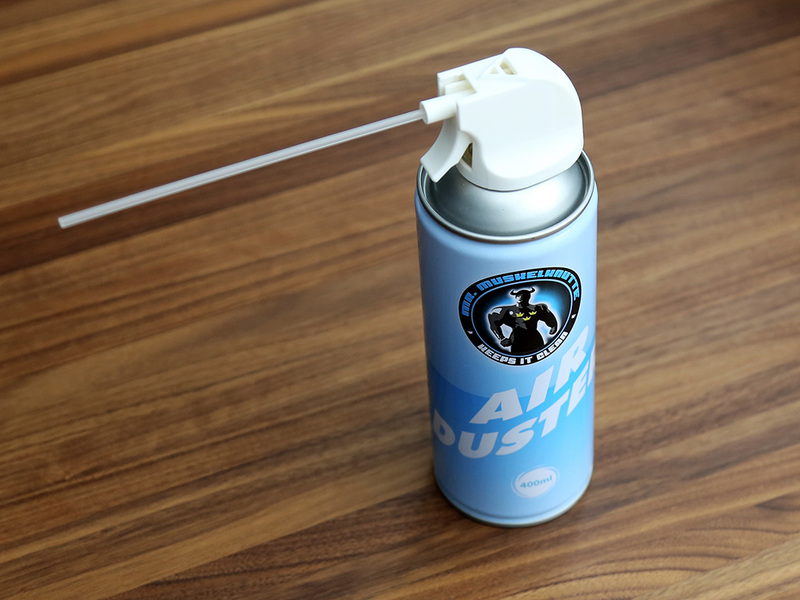 Air duster (pictured above) or gas duster is a can of compressed air that basically blows air through the nozzle and is often used to clean electronics. However, reading into it, there are a few caveats. First, the can should be held upright to avoid liquid from flowing out. Also, eventually the can will get real cold and you have to wait for a while to let it get to room temperature (don’t heat, they may explode). Alternating two cans is a good option for the latter issue. Those are the operating considerations. The real problem, however, is what comes out of the can. Depending on the product, it probably isn’t just compressed air. These contain inhalants that can be abused and are potentially quite dangerous if inhaled directly, so this is not something to leave with the kids. While the inhalants may vaporize quickly, some products can leave residue. Due to the abuse-potential of the stuff, the residue may contain bittering agents intended to stop people from inhaling it, so it is not something you want in places people touch. Like toys. So, I think I’ll leave air dusters to electronics and simply wipe my LEGO clean from now on. Mind you, I didn’t notice any issues or effects with trying the duster on LEGO, but in the long run better safe than sorry. My next method was, thus, decidedly less exotic. As I wrote previously, my main solution for cleaning LEGO in my quest for Lion Knights’ castle has been the brick pool (pictured above). 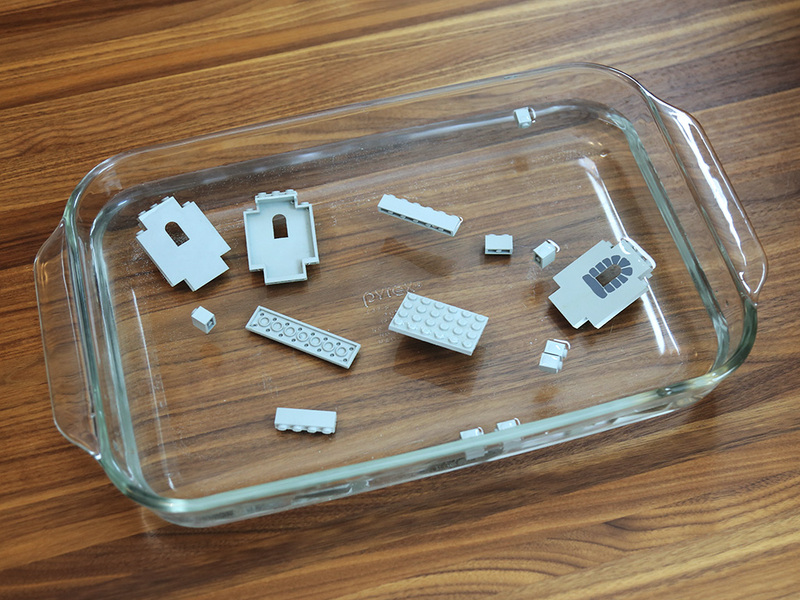 Unwilling to wash all requisite LEGO the hard way with warm water and soap, I filled a glass pan with cold, soapless water and set it onto my building table. As I picked bricks from the sorted boxes, I dropped the pieces into the pool for a while and then toothbrushed them and dried with a kitchen towel – before laying them onto the castle-in-progress. The pool has worked fairly well, but is also tedious work that keeps interrupting (and dripping on) the building process. Obviously all this would be less of a chore if I picked and cleaned the pieces before I build, so this process is something I must think about in the future. Mental notes for next time: No compressed air, no brick pools. Should I risk the washing machine?